Learn about digital transformation and IT4IT, a vendor-neutral Reference Architecture for managing the business of IT utilizing other frameworks and practices like ITIL, COBIT, TOGAF, and PRINCE. The IT4IT Reference Architecture standard comprises an architecture and value chain-based operating model for managing the business of IT. The operating model defined by the standard serves the digital enterprise with support for real-world use-cases (e.g., cloud-sourcing, software-defined datacenter, Agile, DevOps, and service brokering) as well as embracing and complementing existing process frameworks and methodologies (e.g., ITIL, COBIT, SAFe, and the TOGAF standard). The IT4IT Reference Architecture provides a prescriptive framework to support the value chain based IT operating model and service-centric management ecosystem. Think of it as describing all information you need to run and optimize IT, defining the automation you need to support end-to-end value streams, and the standard and open integrations with the external service providers. The IT4IT Reference Architecture also provides a standard blueprint of all IT solutions needed for managing a modern IT organization. It offers great value to any company that takes managing the business of IT seriously, and especially those with an interest in business and IT transitions. It allows the IT function within an organization to achieve the same level of business discipline, predictability, and efficiency as other functions in the business. The standard is focused on defining, sourcing, consuming, and managing IT services by looking holistically at the entire IT Value Chain. While existing frameworks and standards have placed their main emphasis on process, this standard is processagnostic, focused instead on the information (or information systems) and automation to manage a service through its lifecycle. It describes the functional components (IT management software) that are required to produce and consume the data. Once integrated together, a system of record fabric for IT management is created that ensures full visibility and traceability of the service from cradle to grave. The IT4IT Reference Architecture is built around the concept of a value chain. The IT Value Chain is the series of activities that IT performs to add value to a business service or IT service. Each value stream is centered on an essential element of the Service Model and the constellation of key data objects (Information Model) and functional components (Functional Model) that support it. Together, the four value streams play a vital role in helping IT holistically manage the full service lifecycle. The IT4IT standard breaks down the IT Value Chain into four (4) value streams to help IT consume the IT4IT Reference Architecture more easily. Each value stream represents a key area of value that IT provides across the full service lifecycle. Each value stream is centered on a key aspect of the Service Model, the essential data objects (Information Model), and functional components (Functional Model) that support it. Together, the four value streams play a vital role in helping IT control the Service Model as it advances through its lifecycle. Strategy to Portfolio (S2P): The Strategy to Portfolio (S2P) Value Stream receives demand for a new or significantly improved service from the business and develops the Conceptual Service Blueprint to represent the new or enhanced business/IT service that is requested. The Conceptual Service Blueprint is the bridge between business and IT in that it provides the business context for the service along with the high-level architectural attributes. Requirement to Deploy (R2D): The Requirement to Deploy (R2D) Value Stream consumes the Conceptual Service Blueprint and triggers service design work. This results in the creation (or modification) of the Logical Service Model that contains more detailed requirements that describe more technical aspects of the service. The R2D Value Stream is where sourcing, development, builds, tests, and releases are created, resulting in a deployable service (expressed as the Service Release Blueprint data object). Request to Fulfill (R2F): The Request to Fulfill (R2F) Value Stream receives the Logical Service Blueprint after it has gone through development, test, and release approval. For repeatedly consumable services, the R2F Value Stream transitions the service into production and makes it consumable for its users. Also it creates a Service Catalog Entry. Detect to Correct (D2C): The Detect to Correct (D2C) Value Stream is engaged and begins monitoring once a new service is put into production and when the business requests another instance of a service in the Service Catalog to create and manage the Physical or Realized Service Model. This is the Physical Service Model that contains information used in the creation of a service instance (realized service) such as technology and platform choices, locations, configuration settings, and supplier requirements. The IT4IT standard is for those organizations that realize a fundamentally different approach is needed for managing the new IT. The new IT organization is characterized by sourcing and orchestrating IT services from many internal and external service providers such as cloud vendors. The current fragmented approach of ownership of processes, tools, data, and controls inhibits continuous improvement and prevents IT from performing its new role as a transparent and added-value business partner. Traditionally, the implementation of IT management solutions required a large amount of configuration and customization before these tools could actually be used within the IT organization. IT tool vendors have long been offering proprietary solutions for specific functions within the IT Value Chain, but without any real standards for integration. Although IT management tool vendors and IT organizations use best practices and standards such as ITIL, the actual implementation varies considerably between organizations, and interoperability between tools is still cumbersome. There are still a lot of detailing and design choices to be made before ITIL can be operationalized and supported by automated tools. As a result, IT organizations are forced to build these themselves in isolation and typically at huge cost. This is simply unsustainable given the increased move towards cloud and outsourcing providers, and is a problem that the IT industry as a whole needs to fix. This traditional approach often results in a complex mesh of products and solutions requiring countless point-to-point integrations to accommodate the variations in process. The new IT organization also relies more on automation of IT activities supporting these end-to- end processes. Unfortunately, there is not a single tool (or solution) or best practice that covers all IT management capabilities needed to run an IT organization as a business. Therefore, we need to carefully select IT management tools and best practices to be implemented in the IT organization. To equip and empower the IT employees with the right set of tools (to automate end-to-end workflows) and provide information to support decisionmaking, a blueprint or reference architecture is required defining how to manage the business of IT. This integrated model supports the IT4IT value streams that are needed to significantly improve the performance of IT and to facilitate the transition to a Lean, Agile, and streamlined IT operating model supporting a new multi-vendor IT ecosystem. This is in contrast to how IT management has been executed up to now, which was basically an unplanned and ad hoc approach to implement IT management tools and IT processes. The Integration Model, defining how processes, data, and systems need to be connected to deliver value to the business. These pillars, when captured and modeled correctly, remain constant regardless of changes to process, technology, and/or capabilities. The goal of the IT4IT standard is to guide the improvement of the entire IT management capability of an IT organization using a value chain approach. Most CIOs and IT managers have realized that losing sight of the big picture due to the imminent urge of the daily details is blocking them from improving the IT function. Instead of improving specific processes, tools, or information needs, the focus should be on improving the system as a whole. What will IT4IT do for you? ITIL and COBIT are the most commonly used processoriented best practice frameworks for IT Service Management. Both describe a broad range of processes and activities to be performed by the IT function throughout the service lifecycle. However, ITIL does not cover all processes and activities within the IT function, such as Enterprise Architecture, Project Management, IT Governance, Risk management, or Service Development. Domain-specific practices such as the TOGAF methodology for Enterprise Architecture, PMBOK or PRINCE2 for Project Management, and CMMI and SCRUM for Service Development can be used to complete the process model. In addition, there are numerous other standards and practices required to support specific controls, such as related to security management (ISO/IEC 27000 series) or risk management. These different practices and standards are typically defined at a high level, defining the requirements and activities to be performed within the IT organization. However, before they can be used in day-to-day practice they require a significant effort of design and detailing, often resulting in reinventing the wheel by each individual organization. As a result, the IT organization is challenged to create an overarching IT management model bringing it all together supported by an integrated IT management system. To transition the IT organization to become the IT service broker and integrator, a reference model is needed to provide a framework of what is required to run this new IT environment. The IT organization needs to design, build, and implement a solid IT management capability that supports all IT processes through the lens of the IT4IT value streams. The IT4IT standard enables the implementation of this integrated IT management system (or IT4IT management system) to provide an optimized work environment for the IT employees as well as for the business to interact with the IT organization. This IT management system consists of all IT management tools, information, and interfaces to support all IT management activities; enabling fully automated workflows across the many different technologies, teams, and service providers. At the top layer the IT4IT standard provides an integrated and holistic view using value streams. This layer is process and technology-agnostic. It provides the model of how the IT function should be working from an end-to-end perspective. The value streams can also be used as a governance model to assign ownership for IT management capabilities to support, evaluate, and continuously improve IT management practices. Every IT organization will benefit from the first step on the journey by adopting this holistic end-to-end view based upon the IT4IT value streams. Next to that, a selective set of best practices needs to be chosen such as the TOGAF standard, ITIL, and PMBOK (or PRINCE2). These practices further refine the requirements for specific areas such as project management, service development, and IT Service Management. The IT4IT Reference Architecture then provides the glue to incorporate these practices into an IT operating model that can be used to implement the entire IT function supported by automated tools and interfaces using a standard information model. ITIL can therefore still be used to define additional specifications for IT activities to be performed. COBIT can also be added to extend ITIL with specific controls and practices that can be audited and assessed from an IT governance perspective. ITIL and the IT4IT standard are complementary. The IT4IT standard provides the bigger picture to integrate multiple practices needed to manage IT such as ITIL, SCRUM, and PMBOK. In addition, the IT4IT standard provides the architecture to define the target state IT operating model covering a prescriptive definition of how IT needs to work. The IT4IT Reference Architecture is not based on greenfield thinking. IT4IT components can be added incrementally to existing practices to integrate, orchestrate, enhance, and enable the current way of working. The IT4IT standard provides the overall end-to-end model of how the IT function should be managed using an IT Value Chain approach. The IT4IT standard helps to combine existing practices (such as ITIL) as well as emerging practices (such as SAFe) into a new IT operating model. The IT4IT standard provides new IT management practices such as DevOps, Agile, Lean software development, and Continuous Delivery. The IT4IT standard details how IT activities can be automated and supported by IT management tools (by defining a standard information model, functional components, and its interfaces). Why Gain an IT4IT Certification with Good e-Learning? Good e-Learning offer all the learning materials required to become a certified IT4IT practitioner! 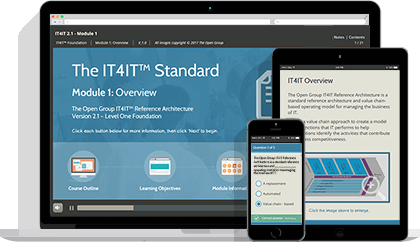 Our IT4IT Foundation course has been fully accredited by The Open Group and meets all the learning requirements of the latest version of IT4IT (v2.1). As such, students can rely on this course to provide all the information they need in order to sit and pass the official IT4IT Foundation level exam. 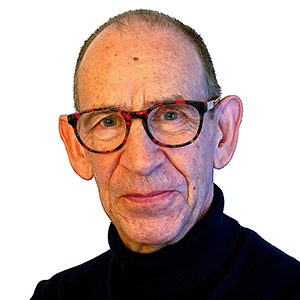 Also known as The IT Paradigmologist, Mark thinks, writes and speaks extensively about IT 'paradigms' - in other words our changing perspectives on IT. Mark is an IT Management Consultant and Global Ambassador at the ASL BiSL Foundation. He has spoken at hundreds of events in more than twenty countries. Want to learn more? View our full portfolio of Digital Transformation courses, or find out more about corporate IT4IT training!